I'm so bummed that I'm missing all these amazing sample sales. 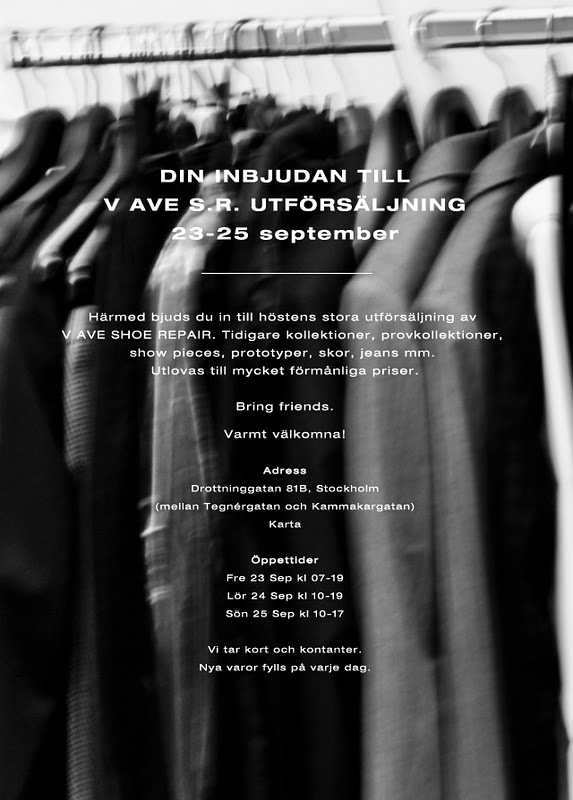 Anyway, if you're in Scandinavia make sure not to miss the V Avenue Shoe Repair Sample Sale. Believe me you will regret it if you skip this one. My friend Sandra scored a couple of really really rad shirts for almost 200kr the last sample sale they had! That's like shopping at a nearby H&M and Weekday. Actually, it's even cheaper! Guys, enjoy shopping and show me all the good stuff you picked up! We invite you to our clearance sale of all previous collections! All items at very good prices during three days.